Do you want opinion on fashion & makeup products from an influencer who agrees with the product being promoted and is not doing it just for the sake of it? Look no further; introducing Gia Kashyap. Her Instagram handle is full of aesthetics and amusing captions. 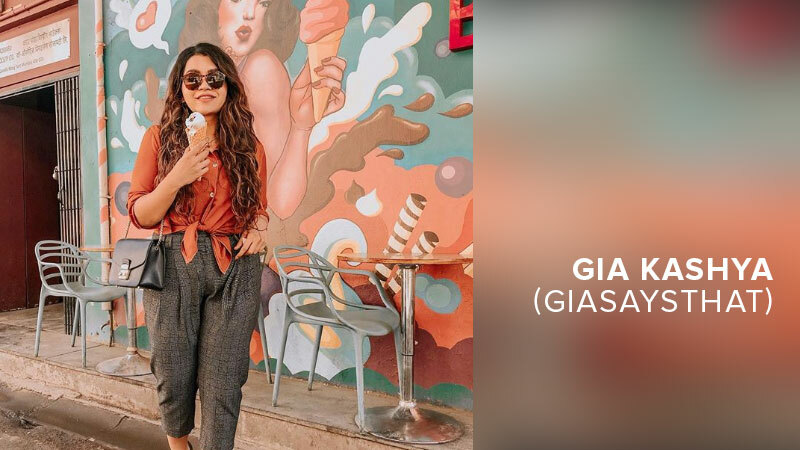 With her blog (GiaSaysThat) Kashya, shares her travelogues, along with her favorite fashion and makeup products. In this interview with Social Samosa she shares what goes behind it. It all began in 2009 when I decided to dive into the world of Blogging. I was one of the first few Fashion/beauty bloggers in the country. I was bored with what I was studying in my first year of college and wanted to do something interesting. I started my blog because that’s the only way I could express myself outside my college as I was studying a completely different subject. Today, it’s all about Instagram. The social media world keeps changing and over the years, I have learned to adapt myself. “Gia Says That” started off as a very opinionated blog. It’s about what I “Say” or convert to my audience about my lifestyle, my favourite makeup products, Fashion products and so on. I have always been someone who has a strong opinion about everything so hence the name. I treat every project or paycheck as my first and give it my 100 %. I never take anything for granted. My experience also helps me out. I basically know how the industry rolls! Other than that, I am very organised with work. I might have a messy room but my work is extremely organised and I am quite proud of it. My content isn’t just content but it’s me. What you see online is what you get offline. I am literally the same person offline too. A number of people advised me to tone it down online because they felt that I shouldn’t “reveal” my personality. But I could never do that. Over the years, I have opened up a lot more to my online family and I am grateful for that. My Social Media manager and I create a calendar before every month for blogs and content. However, a lot of the additional content you see are just impromptu, especially on Instagram stories. I don’t try hard to stay relevant. I don’t try hard to make a video viral or a post viral because it’s just temporary. To me, my content has to speak for itself after years. Not just for a day or two. Brands pay bloggers/influencers to feature their products on the blog, Instagram profile or stories. I always mention if it’s paid or an Ad in my posts. I am very stubborn that way! I have rejected a number of brands solely because I didn’t either agree with their product or wasn’t happy about the way they want me to portray their product. Honestly, content creators know better about what works for their audience than the brand itself. 80 % of the creative aspect of the image/video should be left to the content creator. When I bump into my readers and they tell me how I have influenced their lives in a positive way. A condom campaign where they asked me to make the condom look “Enticing”. My day isn’t fixed as some days I have photo shoots and some days I have to stare at my laptop for hours responding to emails. I wake up at 7:00 AM and hit the gym. Once I am back, I Play with my puppy pixie. By 11, I get to work. Respond to all Mails. Get on calls. Photoshoots. Edit videos. Usually, I get done by 7-8 PM. If there’s an event, it takes more time. I used to own an e-commerce business 4-5 years ago. I shut it down mainly because my blog picked up and I couldn’t handle both. However, I really wish to start another business in the coming years.